PARTICIPANTS: Maurry Martin (Skipper), Brent Stephenson, Barry Hartley, Sav Saville, Steve Wood, David Lawrie, Gillian Vaughan, Keith Woodley, Lorna Simpkin, Prue Cozens, Audrey Williams, Tim Barnard and Lyle Millar. WEATHER: Showers started the day in Whitianga, but as we headed out to sea, we left these behind. There was a moderate sea running early on with 1m swell and 1m chop, but later in the after noon this increased a little. Wind was about 20-30 knots from the south-west, increasing slightly during the afternoon. As we left the Marina a reef heron spotted by David Lawrie on the rocks nearby was a good start to the day. Heading out through the harbour we encountered large numbers of fluttering shearwaters feeding in association with schools of bait fish. White-fronted terns were also feeding and so to were six Arctic skua, looking fantastic in their breeding gear. Slightly further out there were several little penguins, and agrey-faced petrel flew past, and then the call went up for ‘storm-petrel. Two white-faced storm-petrels gave excellent close views, and for the next 2 hours or so we were treated to excellent views of these great little birds, with 150+ being seen during the course of the day. As we got out a little further, we started to see flesh-footed and Buller’s shearwaters, and two common dolphins made a brief appearance. Then out further Sav called a ‘dark’ storm-petrel. The bird was flying in towards the boat from the direction we were headed and most quickly got onto it as it came in, did two loops, one of which gave excellent views of the underside of the bird, and the call for BLACK-BELLIED STORM-PETREL went up. However, photos taken of the bird do not confirm the bird as a black-bellied, and there is currently some debate as to the validity of several field characters that are supposed to be diagnostic, such as toe projection past the tip of the tail, which this bird had. The bird also had a rather smudgy white belly, with indistinct demarcation of the breast and belly. WHITE-BELLIED STORM-PETREL was then seen as a more likely option, based on the time of year, and some plumage characters derived from the photos taken – CLICK HERE for the latest on this identification problem. However, the plot thickens…..and this could potentially be the rediscovery of a supposedly ‘extinct’ species! A little further and the call went up for ‘cookilaria’. Over the next few hours we were lucky enough to see quite good numbers of these petrels, and were able to identify at least some definite PYCROFT’S PETRELS. A small group of birds feeding over several bottlenose dolphins were mainly flesh-footed shearwaters, but several ‘cookilaria’ petrels were also amongst them. As we moved on we started to see more of these birds, and even with good views we were unable to determine specific id of some individuals. By the end of the day, we had managed to get great views of quite a few Pycroft’s petrels, and some birds we feel were probably Cook’s petrels. However, the huge amount of variation in the plumage of Pycroft’s has left us a little uncertain about a lot of individuals. Not long after the feeding flock, a shark was spotted basking on the surface, with quite a sizable dorsal fin protruding from the water. 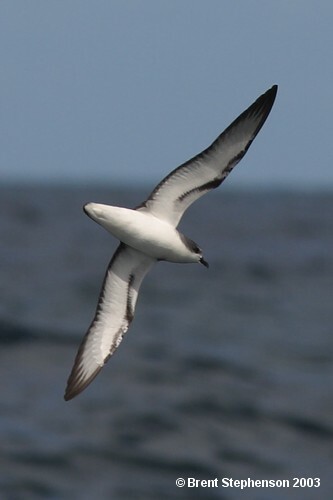 Numbers of Buller’s shearwaters increased and we started to see a few fairy prions. We decided to chum with chunks of fish behind the boat about 12 km off the Mercury Islands from about 1430 to 1530, managing to bring in good numbers of flesh-footed shearwaters and seeing increased numbers of Buller’s shearwaters and ‘cookilaria’ petrels. A single black petrel also came into the boat, the only one seen during the trip (contra to the trip in March 2002, when we saw c.35 of this species). We started to head in towards the Mercury Islands at about 1730, pounding into the sea, making the trip a little uncomfortable at times. In the lee of Stanley Island we had a break, hearing saddleback andparakeet on the island, and then decided as we had gotten great views of our target species at sea, we may as well head into port a little earlier than planned. 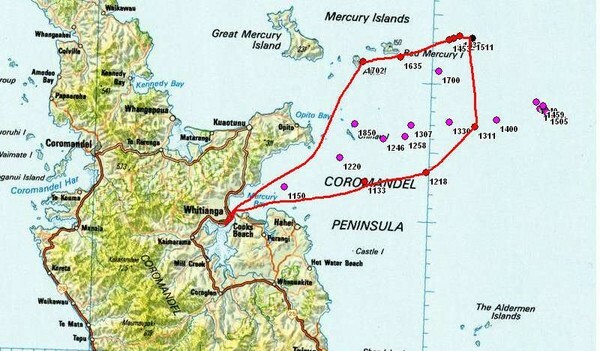 The trip between the Mercury Islands and Whitianga was fairly uneventful, except for a large group of gannets, a group of flesh-footed shearwaters, and nice breeding plumage Arctic skua (de ja vu) as we approached the Marina, arriving just before 2100. The red line indicates this trips route. Pink circles represent points taken on last years trip – 17 March 2002. Produced by Barry Hartley.